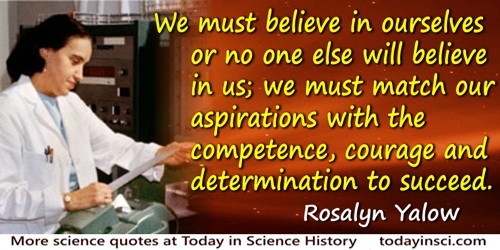 All women scientists should marry, rear children, cook, and clean in order to achieve fulfillment, to be a complete woman. Quoted in The Chemical Educator, vol. 7, No. 2, in a book review of Eugene Straus, Rosalyn Yalow, Nobel Laureate: Her Life and Work in Medicine. Don’t be afraid of hard work. Nothing worthwhile comes easily. Don’t let others discourage you or tell you that you can’t do it. In my day I was told women didn’t go into chemistry. I saw no reason why we couldn’t. I hope when I get to Heaven I shall not find the women playing second fiddle. In the past, few women have tried and even fewer have succeeded. Nobody … took me seriously. They wondered why in the world I wanted to be a chemist when no women were doing that. The world was not waiting for me. Quoted in interview by Mary Ellen Avery (1997). She [Chien-Shiung Wu] is a slave driver. She is the image of the militant woman so well known in Chinese literature as either empress or mother. As quoted in 'Queen of Physics', Newsweek (20 May 1963), No. 61, 20. 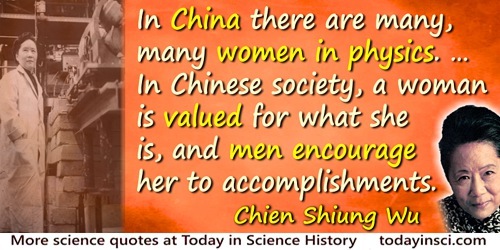 Note: Chien-Shiung Wu was Segrè’s student. The Science of crystallography has been accused of being overrun with women and has been likened to 'intellectual knitting.' ... The international figure for women in crystallography in 1981 was 14 per cent of the population of 8,174 entries in the World Directory of Crystallographers. 'Women in Crystallography', in Gabriele Kass-Simon, Patricia Farnes and Deborah NashWomen of Science (reprint 1993), 335-336. The war gave women like her opportunities, not a feminist movement, and if the opportunities dwindled after the war, she feels that it was because women didn't want them.